Eat, Greek, and Be Merry: the Greek Theatre Turns 100! Drama and arts and crafts have been intertwined in Detroit history for more than 100 years. Under the auspices of the Detroit Society of Arts and Crafts (DSAC), on January 19th 1910, May Morris (daughter of William Morris) captivated a capacity crowd at the Detroit Museum of Art with her illustrated lecture “Pageantry and the Mask.” Morris’s presentation helped mark a turning point in propelling Detroit onto the national stage as an arts and crafts center. Almost immediately after May Morris left Detroit, Alexandrine McEwen, a bookplate artist and founding member of the DSAC, penned what was termed a “modern immorality play” called Everywoman with characters named “Suffrage” and “Art.” Less than a month later, she wrote The Masque of Arcadia, another outdoor play held on the grounds of Clairview, J.L. Hudson’s Grosse Pointe estate. These performances led to the DSAC being the first to foster a little theatre as part of their program. By 1914, George Booth (the first president of the DSAC) already had plans in mind for a bathing pavilion and a theatre on the hill overlooking Cranbrook House. (My own suspicion is that he did not like the fact that the DSAC performances were not held on HIS estate!) In early 1915, Booth commissioned Canadian architect Marcus Burrowes to draw up the plans for an outdoor Greek Theatre. The open-air amphitheater, constructed of stone, seats nearly 300 people and was described in contemporary news articles as a “gem of architecture” and a “temple of art.” By May 1916, landscaping was underway and red tulips graced the front of the bathing pavilion. Invitation Card, The Cranbrook Masque, June 1916. George Gough Booth Papers. 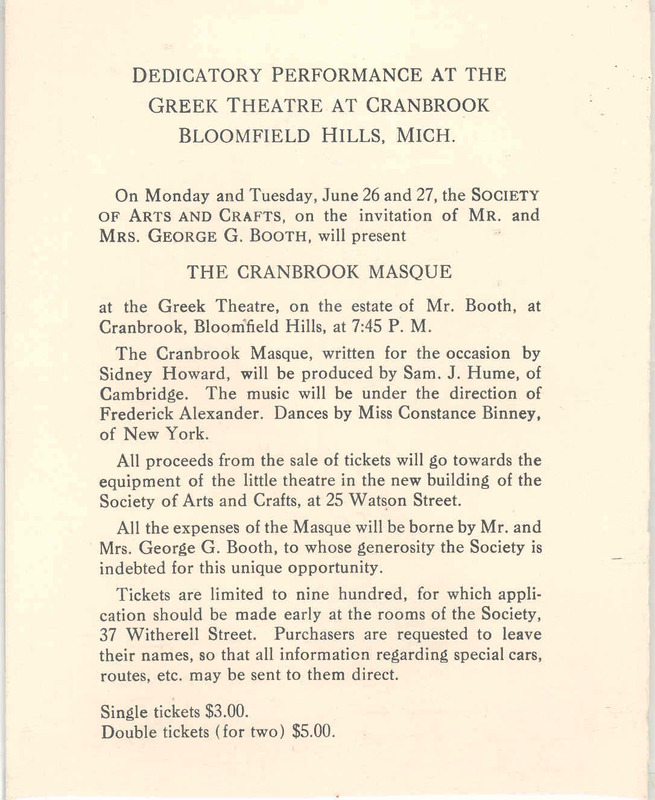 Meanwhile, the DSAC was planning the production of The Cranbrook Masque which would also serve as the public dedication for the new Greek Theatre. The play showed the development of drama from ancient to modern times in five episodes, emulating May Morris’s lecture theme from 1910. For more on the play, see an earlier blog post. The Cranbrook Masque at the Greek Theatre, 1916. Hand-tinted glass slide. Fast forward to 1991 and the 75th anniversary of the Greek Theatre. A team of dedicated Cranbrook staff, historians, and theater enthusiasts initiated the restoration of the Greek Theatre and a contemporary production, using the script from the original Masque, this time with cast members from St. Dunstan’s Guild and dancers from Jessie Sinclair’s Cranbrook Kingswood Dancers. Cranbrook House sunken garden (originally called the kitchen garden) with staked tomato plants, ca 1915.